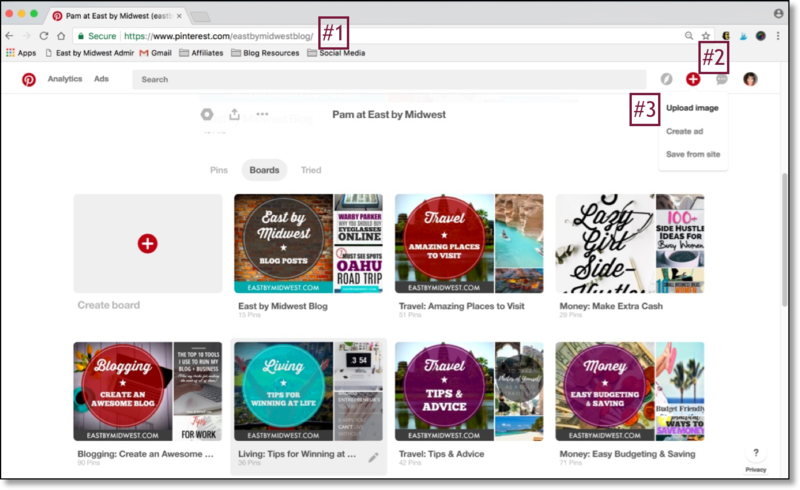 Pinterest is a great way to connect your ideas and blog posts with a wide, engaged audience. One way to stand out from the crowd is to create covers for your Pinterest boards. Find out more about Pinterest board covers below, plus follow my easy instructions to create Pinterest board covers of your own. What are Pinterest board covers? 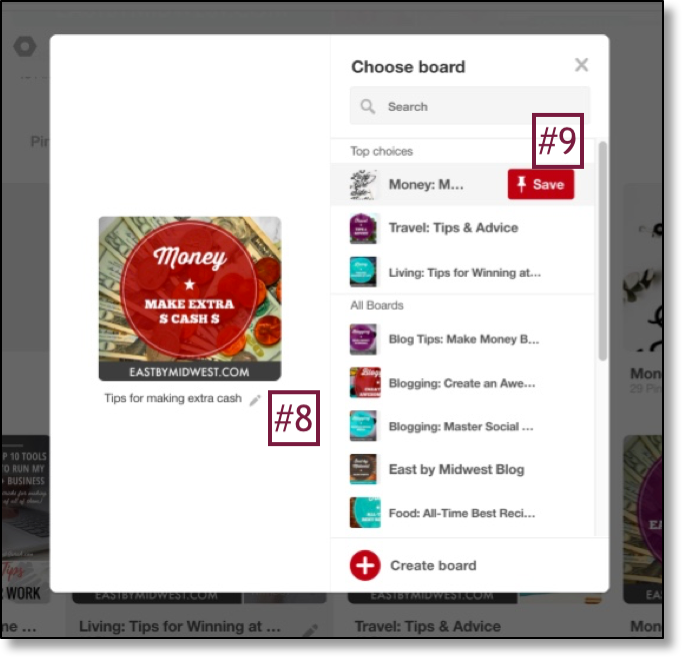 Pinterest board covers are visible when you go to the page in Pinterest with all your boards. For example, my Pinterest boards can be found here. The cover is the picture in the left square of each board. 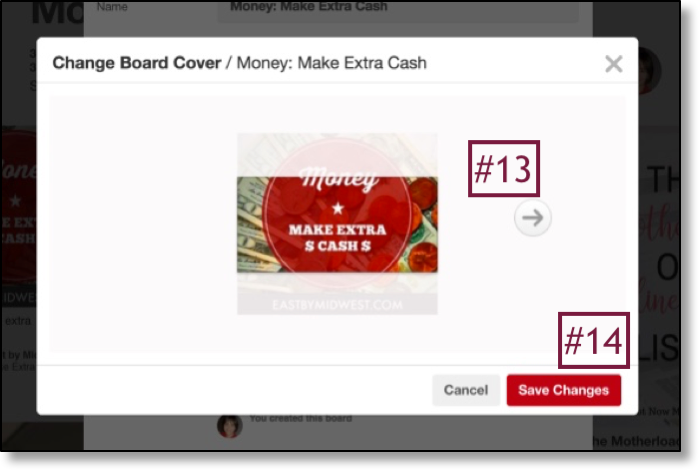 Why should you create Pinterest board covers? Create visual organization. One of the great things about Pinterest is the variety of visually interesting pins. But all those great pins can be overwhelming at times. 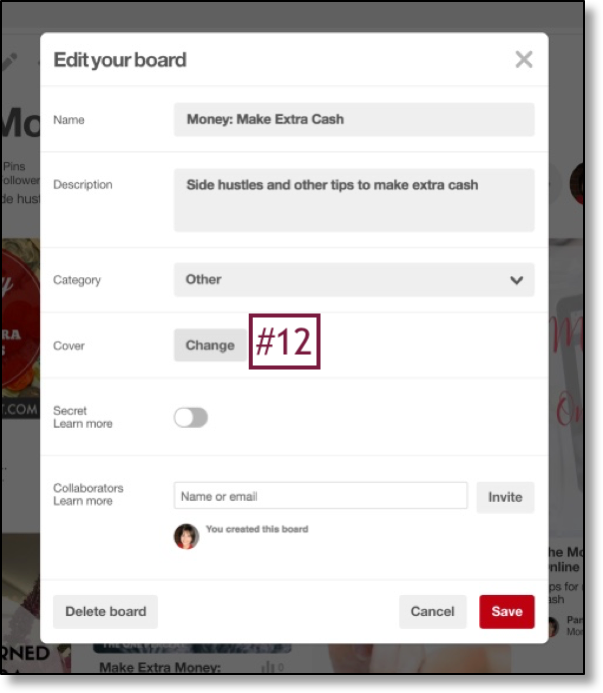 Using a consistent color, font, or picture theme in each of your board covers can make your Pinterest board page look less overwhelming. Draw attention to your website or brand. In your board covers, you can include references to your website or brand. In my board covers, I include my website address (eastbymidwest.com) at the bottom of each cover. This is an easy way to draw attention to the website behind the pins. Apply consistent branding. 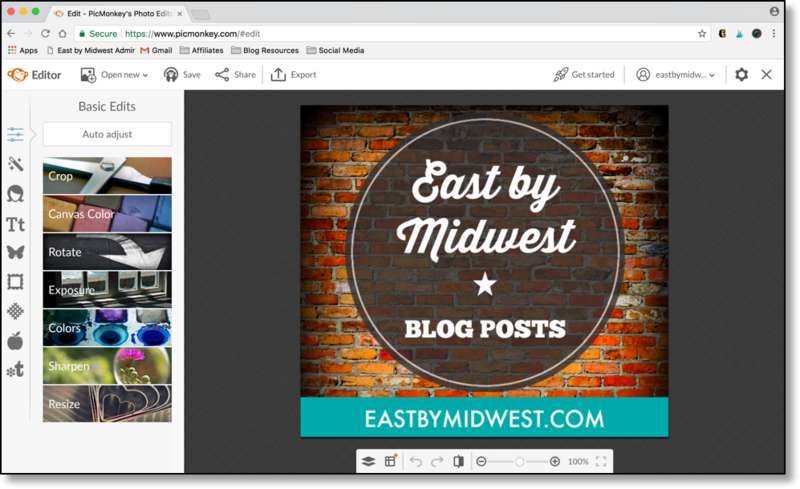 If you have a specific color, font, or picture theme on your website, you can use that same theme in your Pinterest board covers. That will help you create a consistent brand image across multiple platforms. Stand out from the crowd. 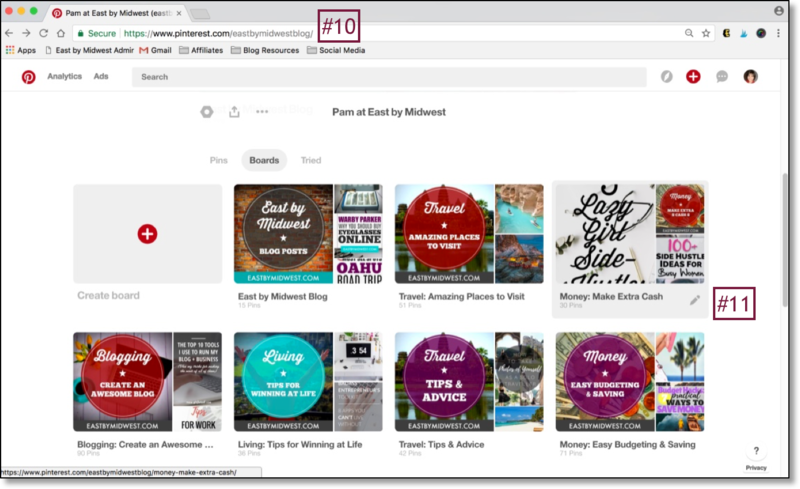 Although Pinterest board covers are easy to create and add, many people don’t have them. 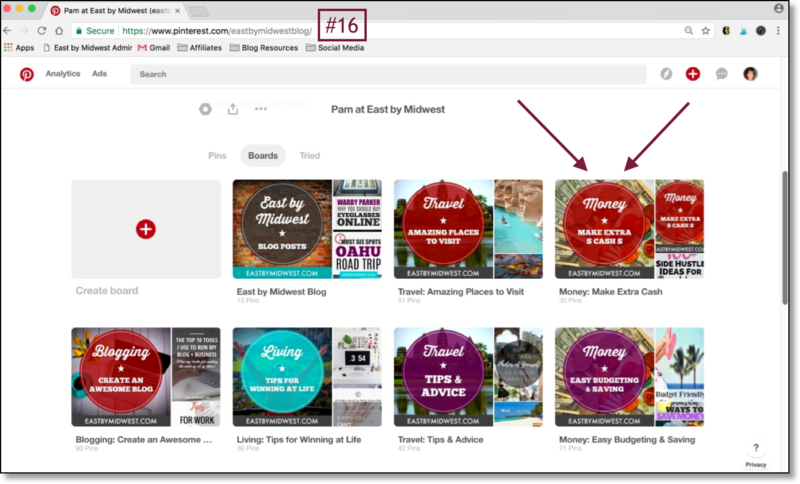 Adding Pinterest board covers is an easy way for you to separate yourself from the crowd with an organized, professional, and visually appealing Pinterest board page. How do you create Pinterest board covers? The board cover is an image that you’ll create and load to Pinterest as a pin. There are lots of great resources available to help you design your Pinterest board covers. I used PicMonkey to create my Pinterest board covers. I prefer PicMonkey because it’s easy to use and has a lot of templates so I don’t have to start from scratch when creating my Pinterest and website designs. What should your Pinterest board covers look like? Used the same background picture for similar topics. For example, I have several boards related to money (budgeting and savings tips, how to earn extra cash, etc.). For each of those board covers, I used the same background picture of bills and coins. Used the same PicMonkey filter for each picture so it had a similar look. Added my website address (eastbymidwest.com) to the bottom of each cover. Using a PicMonkey template, created a text graphic that included the name of the Pinterest board. I used this same text graphic for each board cover, but varied the color to add some differentiation between the boards. Centered the text towards the middle of the image so that it wasn’t cut-off when Pinterest re-sized the image to fit its size limits. What size should you use for Pinterest board covers? I’ve seen various size recommendations for Pinterest board covers, but all indicate that the width is slightly longer than the height. If you try to use an image where the height is a lot longer than the width, Pinterest will cut-off the image. My board covers were 600×541 pixels when I finished creating them. I loaded them at that size into Pinterest and Pinterest automatically re-sized them to fit the required dimensions. How do you add covers to Pinterest boards? 2. In the upper right-hand corner of the screen, click on the red circle with a white plus sign. 5. 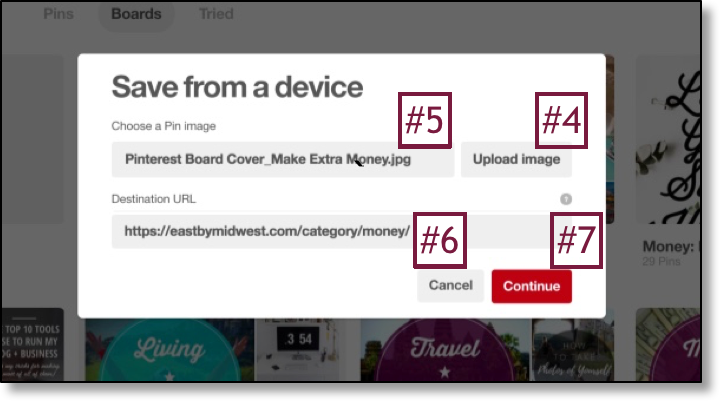 Locate and select the first board cover you’d like to load into Pinterest. Option 1: You can enter the address for one of your website pages. 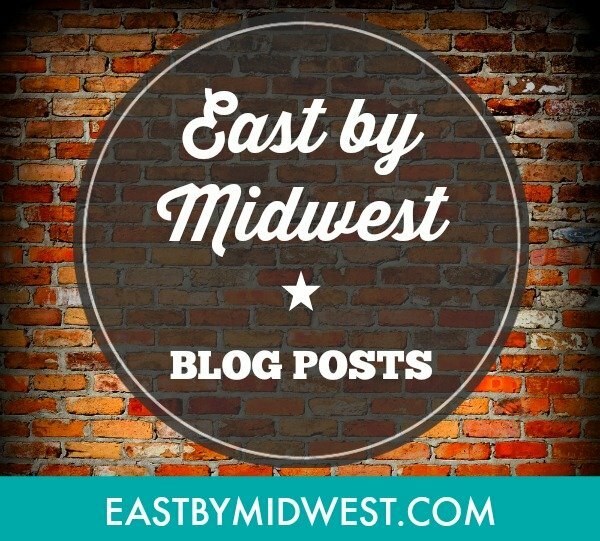 For example, if the Pinterest board relates to the category “Money,” I can enter the website address for the same category on my website: https://eastbymidwest.com/category/money/. Option 2: You can enter the website address of the Pinterest board that will use this image as its cover. 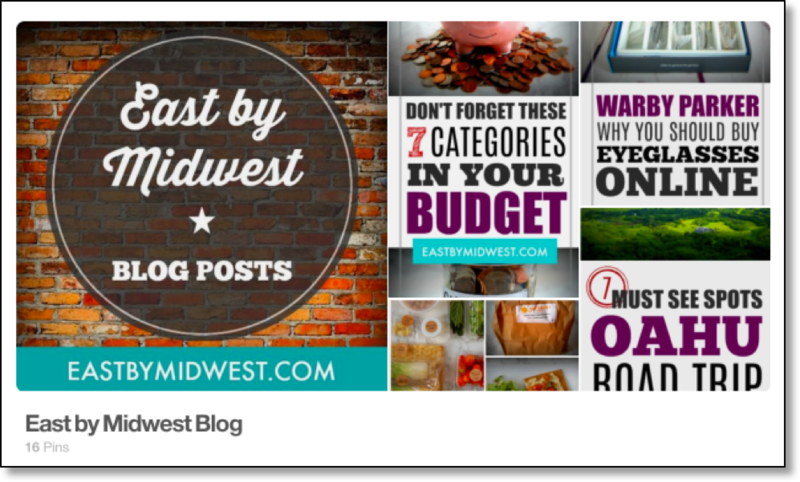 In this example, I’m using the image for my Make Extra Cash Pinterest board, so would enter https://www.pinterest.com/eastbymidwestblog/money-make-extra-cash/. 8. In the next window, add a description to the pin. 9. Locate the board that’s related to your cover and click “Save” next to that board. 10. Go to your Pinterest boards page. 11. Locate the board for the pin you just added and click on the pencil icon in the lower right-hand cover of the board. 13. In the next pop-up window, a box will appear that will let you scroll through all your pins to pick one to be the cover for your board. Since you just added the image, it should be the first image that pops up. Don’t worry if your image appears to be cut-off. If you stuck to an image size where the width was slightly longer than the height, Pinterest should automatically resize the image to fit its required dimensions. If not – you still shouldn’t worry. You can easily resize the image on your computer and reload to Pinterest. 16. Go back to your boards page. Boom! You have a board cover. Repeat the steps above for each of your boards. I can’t wait to see all your beautiful board covers!